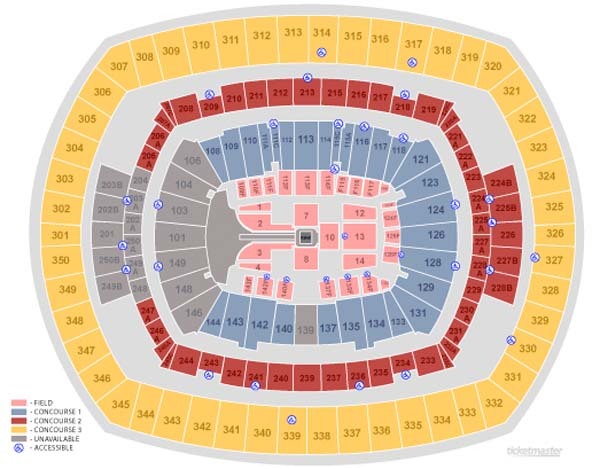 Ticketmaster released the seating chart of the MetLife Stadium for WrestleMania 29 just days before the pre-sale starts. There will be four sections in total – field, concourse 1, concourse 2, concourse 3, and concourse 4. There will also be limited accessible seats throughout the whole stadium. One thing that is very odd is that the field could really hold much more seats but for some reason they’re going with an odd style, leaving four large empty sections. The pre-sale starts on Thursday at 10AM EST and ends on Friday at 11:59PM EST and then tickets go on sale to the general public on Saturday at 10AM EST.